On Mother's Day, 2011, at 2 am in the morning, seven of our horses arrived in Colorado, having been moved from their previous homes in New York State. In April, 2012, two more horses arrived from Iowa. It has been quite an experience getting to know these horses that we have owned for several years. 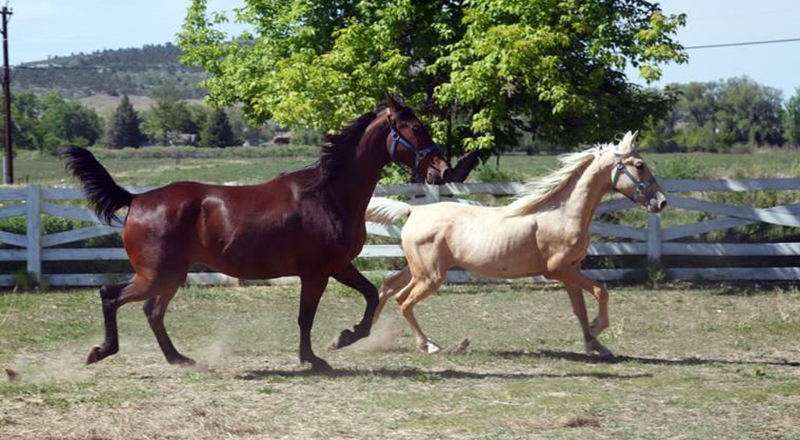 The decision to move these horses to our Colorado facility was made because we have been lucky to have some wonderful part-time trainers working with our horses in Colorado. In the best interest of the horses, it was determined that we take the time to train them and show them that "life is good"! Contact us to inquire about the availability of these horses. Whoopee – Zipper and Daisy 'living it up'! Zipper has been Daisy's 'friend' since she was born and it's fitting that they are still together while Daisy is growing up. Zipper: Believed to have been an Amish carriage horse, foaled in 2006 and standing approx. 17+ hands. He is overly friendly and, in free-style, literally floats with beautiful ground covering gaits. We're excited to start him going under saddle - he will be spectacular. Daisy: Foaled in 2010, Daisy is an endearing, American Saddlebred mare. At this time she is not registered because her dam was taken from Horses Forever before we could obtain a DNA sample. 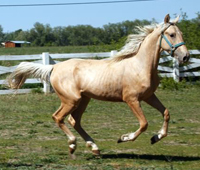 Daisy is by Bobby Sea In Gold (see They're Home), a lovely, golden American Saddlebred. You will be over come by her curiosity and friendliness. She will start her ground work this Spring and work in harness this year. Her progress in harness will determine how quickly she will move into saddle work but she probably will spend the next two years in harness and driving. 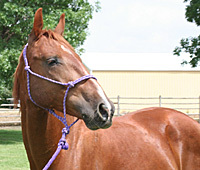 Country Prince is an exceptional, approximately 17 hand registered American Saddlebred gelding. He was foaled out of Jimble Jamble (on Memorials page) in 2004 - has excellent solid gaits under saddle with floating movement and is sound, sane and healthy. He is very confident and his self-esteem allows him to be very adventuresome. It does appear that he might proceed into the world of eventing, if the right person were to work to his full potential. 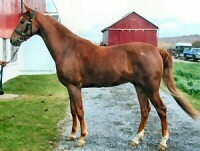 Rush Decision: January, 2002 registered American Saddlebred mare that has had some training under saddle. She does all her gaits: walk, trot and canter. She will make a good trail horse. Rush is currently in training and lessons have begun with learning whose space belongs to whom? She is a very willing mare once she knows what you expect and her conformation and beautiful attitude does reflect her exceptional bloodlines. She is a nice size mare, about 15.3 hands, and we have seen such a good improvement into a caring mare that wants to be included and tries very hard to be accepted. Butch is a wonderful, likeable, big 7 year old American Saddlebred gelding (Jan. 2006) (registration pending) who loves everyone and wants to be a part of everything that is going on around him. He was born to Horses Forever, while in a foster home, out of Lacy's Flirtation (see "In Memoriam") and they both came to Colorado in May, 2011. He appears to learn very quickly, wants to please and has good, solid gaits. He has had a hiatus while he matures and is now ready to move into the next phase of his life – learning to go under saddle and find a new, 'forever' home! It's obvious that he hasn't ever had a bad experience! It shows all over him! His potentials are unending and with his solid start he should be a wonderful prospect for several different disciplines. Mr. Chevalier is a 1992 registered American Saddlebred gelding, who, at one time, was a show horse with a professional trainer. Through his bloodlines he has been endowed with a lower back and due to his current age, we feel he will be best served as a pleasure horse, without stressful demands. He is what is known to some as a "pocket horse" (which translates to: he wants to be in your pocket, all the time). In his lifetime he experienced some unhappy times. We found him in a training barn back East on a very unsuccessful venture and decided to give him a non show horse home. Now he is happily running in pasture. Due to some apparent injuries in his earlier years, we have given him time to "revive" his body and now we think he is ready for a loving, forever home, with some occasional, light, pleasure trail rides. We will work with him, with a light rider, to see if he can carry weight, comfortably – we now owe him a happy retirement – forever. Bolero Kool BH is a 16+ hand, 1999, registered American Saddlebred gelding. As he has aged he has settled down but still has some "memories" that he carries with him. Our previous trainer started working with him under saddle but we decided that he needed more time to heal. We will try him again and see how he progresses. We don't know about his past but he has improved tremendously since moving to Colorado in May, 2011. Calloway's Miss Mizzou (*Ivy") is a 1990 registered American Saddlebred mare that has always been a pleasure/trail horse. She and her companion "Maggie", who has since passed away, came to Horses Forever as owner surrenders. 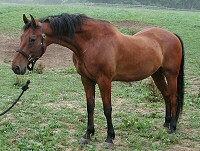 Ivy is a sweet mare who is a prospect for light, occasional trail rides. She loves carrots! Splashdown, believed to be in his late teens or early twenties, came from New York on Mother's Day. 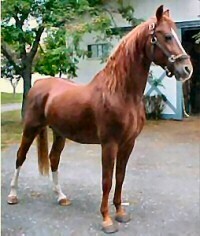 He is an unregistered American Saddlebred gelding, believed to be in his late teens. Having him here to watch, regularly, there is no doubt that he is the son of Bluefield's Stone of Fortune who lived here in Colorado until his death in 2010. "Splash" came out of a cruelty seizure in New York, along with 20 other Saddlebreds, many of whom could never be identified, even through blood tests. However, we now know, just by having Splash here with us, in his father's stall, as well, there's no question about his sire lineage. He was sick when he arrived and so his progress has been slower than some of the other horses. He has a very assertive personality but also has a very sensitive side, as well. Due to time constraints, he has not been put under saddle, yet, but he's definitely on the upcoming list. 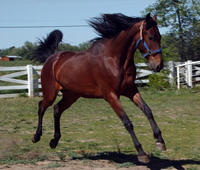 Fred is an unregistered American Saddlebred, purported to be a son of Sultan's Santana. We have owned him for several years and he arrived in Colorado on Mother's Day of 2011. What a wonderful present he is! He is a statuesque late teens to early twenties gelding – moments of spectacular presence, above and beyond what anyone would have thought. Up until he arrived in Colorado he was very suspect of humans in his prior foster homes. (Yes, we use treats here – for every positive thing that happens.) As time and our upcoming winter weather allows, Fred will venture into saddle work and we believe he could be astonishing. 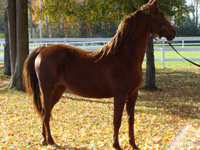 Annie is a 1992 tattooed Chestnut, 16.3 hand, Thoroughbred mare – used by CSU as an embryo-recipient mare. She is a lovely mare who has lived here with us for quite a few years, in amongst the geldings, in perfect harmony. Her history tells us that she was ridden, at one time, but we have not ridden her in recent years. She, too, will be on the upcoming "under saddle" training list. 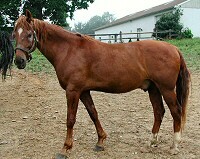 Journey is a 1992 registered American Saddlebred gelding. He has had a very rough past and is better as a companion horse. He is quite laid back in the pasture and seems to be lower in the hierarchy. He can be haltered, work with the farrier but his under saddle skills are very suspect. It probably would not be a good idea to try and ride him, at this point in his life.